Sporting the official Neighborhood Lemonade shirt. I learn a lot from my son. The extended remix title for this post is “Lesson from the Lemonade Stand — What You Can Learn From My 10 Year Old About Branding, Marketing, Business and Life.” 🙂 So listen up… this is good stuff. My son has been offering his parents a steady stream of business ideas since he was able to talk. While adding another choice in Raleigh PR agencies wasn’t one of them, it is true that his entrepreneurial enthusiasm certainly inspired me and was a factor in my decision to start Clairemont Communications. He is not shy about offering ideas for the agency and our clients, and he continues to dream up a variety of dream businesses of his own. The latest: a good old-fashioned lemonade stand. I’ve watched my son set up shop at the end of our driveway for several weeks now, and I realized what a smart business person and marketer he is! I’m compelled to share these lessons from the lemonade stand. Know your audience and cater to them. First, let’s talk hours and location. You might think that the lemonade stand was located at the end of our driveway for convenience only. Think again. The combination of the location and hours of operation — mid-morning to early afternoon on Sundays — was quite strategic. There’s a church in our neighborhood, and one of the two entrances can be accessed at the end of our street. The kid recognized a high-traffic opportunity. Now, let’s talk promotions. On Mother’s Day, he posted “Moms drink free” signs. Think about it. Mom might not be dying for a lemonade, but what dad or kid is going to let that opportunity pass. Of course, they want a cup, too! Capture your customer data. I, of course, adore my child and think he is the smartest human being on the planet. But let me tell you, he knocked my socks off when he thought to do something that many of our clients — even the large, international brands — sometimes struggle to do. I’ve tried to give him his space and watch from afar, but on the third or fourth week in business, I happened to be standing close enough to hear him interacting with a customer. He poured the lemonade, accepted her 50 cents and she took her first sip while he waited to make sure she was a satisfied customer. And then, he was BRILLIANT. Brilliant, I say! With his iTouch in his hand, he asked the customer, “Would you like to give me your email address so that I may notify you about future promotions and special events?” Tarnation Jed, I birthed a marketing genius!!! Customer data, people. Collect it. Use it. When life gives you lemons… or when your lemonade stand comes crumbling down in the blink of an eye, stay focused. Over the weeks, the stand started becoming more elaborate. It’s the way of the Hughens men. They are creators and tweakers. (I think my father-in-law is designing some sort of double-decker lemonade stand for my son as I type this.) Anyway, what started as a pitcher on a cardboard box grew to our glass-top patio table with umbrella, fancy signs and a variety of other added details. In a flash, a small gust of wind bent the umbrella and shattered glass went everywhere. Instead of going into a million pieces along with the glass top, my son quickly got another table from our back porch, helped clean up and it was business as usual. The next time I feel like things are falling apart, I will remember how calm he remained and how the idea of quitting NEVER crossed his mind. Please add my email address to Jacksons’ database. We always stop for lemonade stands. I believe I got a great carwash one day in that same driveway! I will be looking for his Lemonade stand app next!?! We were fondly remembering that just the other day! Aw, thanks Ris. He’s such a smart boy if I do say so myself! Dana, I had the priviledge of being his very first customer. He was still in his learning curve, and was going through his training by a handsome, soft-spoken gentleman in the background (Dave!) You have 2 very wise men in your family. Jackson was eager to get his business off the ground, and his mentor was being so patient and nurturing. I know you’re very proud of both of your men! Good job guys! This makes me smile. 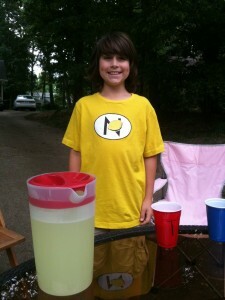 Thanks for being a Neighborhood Lemonade (and overall JW) supporter! Jami, Josie & Margot, since you are local, you just might have to come over the next time he’s open for business! One of the many lessons my mom taught me was to never pass a lemonade stand without stopping and buying a glass. From what I have just read about Jackson’s marketing efforts, I’m not sure I would be able to resist buying a glass (or two)! Way to go Jackson! P.S. I am thinking of setting up a lemonade stand a little ways up the street (closer to the church). I will become the Plankton to your SpongeBob. Way to go Jackson — be sure to save me a glass. What a smart kid you’ve raised! Great story, Dana. It’s true that some companies have a hard time executing the basics. ← Does Facebook Advertising Really Work? Ready to take your PR from blah to voila? For all other inquiries, contact Tracy Lathan at t@clairemontcommunications.com. © 2019 Clairemont Communications. All rights reserved.